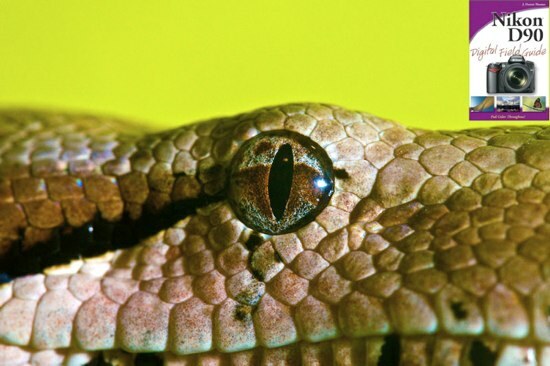 Last update (Aug 25, 2009): Nikon D90 plus Nikkor 105mm VR macro photo of a boa constrictor, by J. Dennis Thomas. Sharp bird photos by Tony. This page is a collection of noteworthy photo samples taken with the Nikon D90 DSLR (digital SLR), image galleries and user pictures that I’ve come across in forums, online communities, blogs and related websites. Bear in mind that the majority of these photos have been re-sized, and may have gone through post-processing, retouching or other edits. I just thought that it would be interesting to see, at a glance, what Nikon D90- owners and users are shooting with their camera. Tony posted a series of sharp Nikon D90 plus Nikon 70-300mm f/4.5-5.6G ED-IF AF-S VR Zoom Nikkor lens bird photos. The lens certainly lets you capture great wildlife photos without having to bust your bank account. J. Dennis Thomas is the author of Nikon D90 Digital Field Guide and has shared one photo of a boa constrictor that was photographed with the D90, 105mm f/2.8 VR AF-S Micro-Nikkor macro lens and SB-800 Speedlight flash. Fourth of July Photos — Very nice carnival and fireworks images by abdoozy, who used a Nikon 70-300mm f/4.5-5.6G ED-IF AF-S VR Nikkor and Nikon 18-105mm f/3.5-5.6 AF-S DX VR ED Nikkor lenses to shoot the pictures. Nikon D90 Review Pictures by Neutralday — This Flickr set has full-resolution images taken with the Nikon 18-105mm f/3.5-5.6 AF-S DX VR ED Nikkor and Nikon 35mm f/1.8G AF-S DX Nikkor lenses, which were used in their D90 review. See this post for the relevant links to some of my favorite 35/1.8G shots from the set. To a question on whether to get a Nikon D90 or Canon T1i / 500D, PerL suggested that the D90, being slightly larger with a faster fps (frames per second) in continuous burst mode and a slightly shorter shutter lag (and I might add, shorter viewfinder / mirror blackout times) makes it a more suitable camera for sports and action photography. In his post, he shared an example of photo taken indoors of a team handball sport in progress. A Nikon 70-200mm f/2.8G VR Nikkor lens was mounted on the D90 for that shot. Sir Mart Outdoorgraphy™ shot this scary bug photo with a Tamron AF 90mm f/2.8 Di SP A/M 1:1 Macro Lens mounted on the D90. Aperture was stopped down to f/16. Follow this link for the full-sized image. This excellent 100% crop of the reptile was photographed by cmvsm with the Nikon 18-105mm lens mounted on the D90. Imaging Resource has a pretty good selection of Nikon D90 RAW files — when you’re there, just do a browser search for NEF. They’ve generously included quite a number of samples in the Japanese-language article (here’s a Google English translation), all shot with the new Nikon 18-105mm lens. Most of the interesting photos are shot in JPEG mode at higher ISO values, and they have an ISO test series of a bug on a flower from ISO 200 to ISO 6400. These should prove useful for evaluating the amount and nature of noise in D90 images. This ISO 200 photo of a building being framed by trees and plants was shot with the Nikon 18-105mm at 18mm and f/8 shows excellent corner-to-corner sharpness. The D90 was put into Landscape mode for this shot.